Tomohiro Arashiro was born in Nago City, Okinawa, Japan. He began studying karate in 1968 with Nakaima Kenko, grandson of Ryuei Ryu founder Nakaima Norisato. A jr. high school student at the time, Arashiro and his friend Matsuda Takeshi would train at Nakaima Sensei's home for two-hour sessions, twice a week. While training on school grounds, the two boys caught the attention of the teacher Sakumoto Tsuguo, who also began to train with Nakaima Sensei. With a growing contingent of students, the Ryuei Ryu style was officially made public by Nakaima Sensei in 1971. In 1979, after completing a degree in Physical Education at Chukyo University in Nagoya City, Aichi, Japan, Arashiro Sensei and his friend Kuniyoshi Tsutomu agreed to immigrate to the United States to teach Ryuei Ryu karate and kobudo. Their fledgling group expanded from informal gatherings in a park in San Diego, to sessions at local recreation centers and VFW halls, to a formal dojo in 1984. 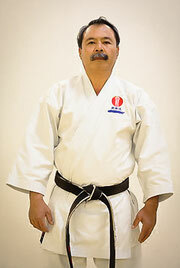 Arashiro Sensei is currently the Pan American Chief Instructor of Ryuei Ryu.